As a metal fabricator, you take pride in your craftsmanship and attention to detail. Whether you create items for form, function, or both, your talent and passion is evident in each and every piece you produce. At Electro Tech Powder Coating, we understand the level of skill and work they go into metalworking and fabrication, which is why we remain a trusted provider of superior powder coating services in our area. Are you ready to take your project to the next level? Discover how we can help. How Can Powder Coating Enhance Metal Projects? Whether we are powder coating new metal, or refurbishing an existing item, we find that powder coating is an excellent finish with a variety of applications. First and foremost, powder coating can add color and finishing effects to any item, allowing you to completely customize the finished product to your specifications. Even if you are fabricating practical objects, powder coating will give them that polished, finished look that will enhance the quality of their final appearance. Beyond aesthetics, powder coating provides a durable finish that is superior to paint. Resistant to chipping, scratches, fading, and other damage, a power coated finish provides weather and heat-resistant protection. As the electrostatic particles cling to the metal, they meld to perform the protective skin that makes this option such a desirable choice for metal items. When you powder coat sheet metal products, you give them a professional appearance while extending their lifespans. This quality makes powder coating an essential tool for metal fabricators. 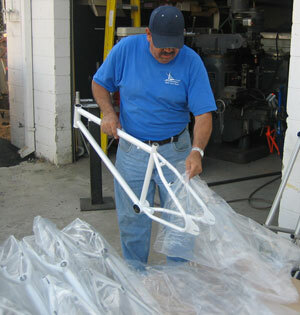 At Electro Tech, we strive to provide the very best powder coating services to our customers. We work with production powder coating runs of all sizes, including everything from single household items to large manufacturing jobs. Our large batch oven can accommodate projects of all shapes and sizes, and we can work with you to complete your project quickly and easily. To learn more about our services, or to request a quote, call our office (760) 746-0292 and we will be happy to help.